The Al Qal'a of Beni Hammad is an archeological site, which holds the first capital of the Hammadid empire. It was founded in 1007 and destroyed in 1152. The Qal'a (Fortress) is located at more than 1,000m altitude. The town includes a 7 km-long line of walls. Inside the walls are four residential complexes, and the largest mosque built in Algeria after that of Mansurah. The remains of the emir's palace, known as Dal al-Bahr, include three separate residences separated by gardens and pavilions. The advantage in Algeria is that almost all hotels and guesthouses have French TV channels, especially appreciated in remote towns like Ms'ila that I reached in a 3 hours ride with a Tintin like shared taxi from Batna, my backpack securely attached on the roof of the cab. The restaurant manager of Kal'aa Hotel offered his services to drive me to the Beni Hammad ruins, about 80km return, towards the Hodna mountains and passing some typical villages that for sure have not seen many tourists yet. The site itself consists of the Dar al Bahar, the great lake palace with its own pool; the great mosque with minaret that I climbed to the very top with a spectacular view. I was told that the old city of Beni Hammad was surrounded by huge entry gates in 3 directions to prevent ennemy forces from entering. That was in the 11th century under the berbic Zirid dynasty which ruled parts of the Maghreb from 973 to 1148. 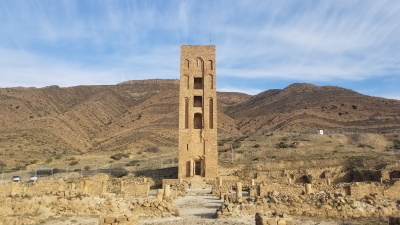 The whole site is nothing spectacular compared with other WHS in Algeria, but is well worth a detour if you are in the region, also because of the quite pittoresque landscape. I was here in November 1991 at the time of the first rumblings of the bloody civil strife which has rendered much of Algeria an unsafe destination since then. I had the place to myself,although someone calling himself 'le gardien' showed up after about an hour to collect an entrance fee. The site lies in an impressive landscape of nearly bare hills and contains the extensive remains of a briefly flourishing city of the 11th century. Most striking perhaps is the 25m(?) 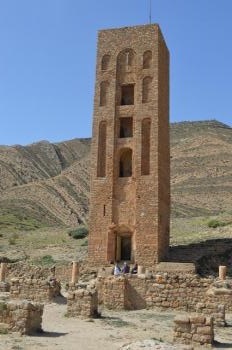 tall minaret built of rough hewn sandstone blocks and still with traces of it's blue ceramic tile decoration in place. In addition to the mosque there are remains of a palace including a bath, a fort and much more. The site is not difficult to reach though it may be necessary to hitch-hike the last few kms. from the N40 to Beni Hammad and in happier times I would recommend a trip there to anyone wishing to see something representative of Islamic culture after the several Roman sites in Algeria. Destroyed during invasion: destroyed by the Almohads in 1152.